Coca-Cola, the world’s largest soft drinks manufacturer, is changing its marketing strategy in European markets to unite four separate brands—regular Coca-Cola, Diet Coke, Coca-Cola Zero and Coca-Cola Life—under the one and only brand, Coca-Cola, while making emphasis on different taste attributes and sugar content in each variant. This will take consumers away from direct associations of Coca-Cola with sugar, thus will help them make healthier, more informed choices, Bobby Brittain, Marketing Director for Coca-Cola Great Britain, says. The first market to see the new package design and communications will be the UK, the company’s flagship Western European market, followed by Scandinavian, North West and Iberia regions since May 2015. The new packaging was developed by the brand and design agency Turner Duckworth, while Epoch Design adapted it to the UK market specifically. 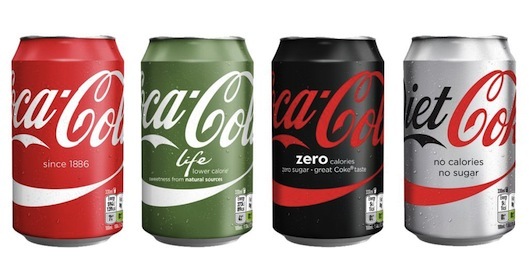 The new “One brand” Coke cans and labels on the glass bottles in the UK will be in four recognizable colours—iconic red, grass green, black and silver—featuring clear points of differentiation (“no sugar, no calories” for Diet Coke, or “since 1886” for a regular variant), along with the government nutritional labeling system. With this move, the company expects to generate about 50% of all cola sales from the low and zero-calories variants by 2020. Posted in Design, Marketing and tagged Coca-Cola, Coca-Cola Life, Coke Zero, Diet Coke, Europe, marketing, package design, UK. Bookmark the permalink.